Husbands Yacht builders moved from Teddington on the Thames to Marchwood in 1928 to establish their yacht building company in this area. In addition to this, they were also engaged in some ship repair and maintenance work, particularly with Oil Tankers calling at Fawley. Because of their expertise at wooden boat construction their war orders were for this type of building. Their first order was for the Motor Minesweepers. These were built two at a time, end to end, in two large sheds. (One of the earliest covered building yards. ) 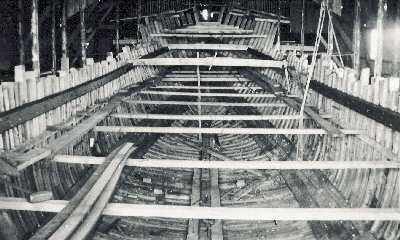 Each vessel used about 250 tons of oak which was required for the 6in. frames and lower planking. The upper planking utilised larch or similar timber. Husbands did much of the development work on these craft and their staff often advised other builders working on the programme. Modifications to the design or building technique initiated in the yard were frequently received from the Admiralty months later as an official alteration, much to the amusement of the builders. Husbands were responsible for obtaining the materials required for the vessels under construction. This often involved many miles of traveling and difficult negotiations with firms attempting to maintain or hoard supplies for their own use "when the war was over ". Due to the shortage of seasoned wood many of the ships used" green" wood which reduced their working life. The search for suitable timber was complicated because, as in the days of" wooden walls" sections of wood with curved grain had to be found for the "knees" used to strengthen joints. To cope with the increased work load Husbands had to take on extra craftsmen. They retained their own shipwrights but also employed joiners from many of the local house builders. This had an unexpected bonus for these firms as it prevented their men being called up into the armed forces, and they had a full workforce at the end of the war ready for the post war building boom, Extra workers were also brought down from Glasgow, but they found the bombing raids too much of a hazard and returned to their own area. Husbands suffered an early set back to their war work when on the night 29/30th. Dec. 1940 the yard was bombed and both building sheds set on fire, two of the minesweepers in them were too badly damaged to be repaired. It was also realised that when the slips were greased prior to launching a ship it made them very conspicuous from the air and encouraged even more bombing. For this reason as soon as a minesweeper was launched it was towed around to Bailey's Hard on the Beaulieu River for fitting out. In addition to hulls completed by their own work force, Husbands also built them for completion by other local firms such as the Southern Railways depot in the Decks which prewar had maintained the Channel Island vessels.